We’re in the second year of offering our Alumni Leadership Grant, a program that funds arts leadership initiatives pursued by our alumni. Angelica Hairston received the grant in its pilot year, and we caught up with her about her project, Challenge the Stats. Note: this interview was edited for clarity and length. Hi, Angelica! Can you describe your project to kick things off? Sure! Challenge the Stats is an initiative that started in 2016 when I was a student at Northeastern University. It’s about highlighting artists of color while helping audiences learn to advocate for social and racial justice, inside and outside of concert halls. I’ve produced two concerts (one in Boston and one in Atlanta that just happened) and developed a website, www.challengethestats.org. From the Top, and specifically my mentor Javier, has been alongside me all the way. It’s been really exciting to see it grow and to think about where it’s going in the future. How have you connected Challenge the Stats with your career as a harpist and educator? 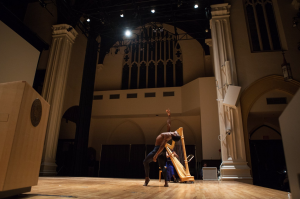 The project was overwhelming at first since I also teach full time – I have over 80 harp students. But eventually, I started to see how my students reflected the statistics I was studying. I was able to put a face and a name to what it looks like to provide access to creative space where people from different walks of life, backgrounds, and understandings of classical music feel safe. I had to reflect on what it means for me as a teacher as I prepare my students, over 90% of whom are students of color, for a field that doesn’t reflect them right now. Having those conversations within the classroom really helps them develop their own voices in whatever field they want to walk into. My classroom became this ground to safely learn together and to safely grow in that process. Angelica accompanies dancer Michael Morris Jr. at the Boston launch concert. Can you speak a little about your experience integrating the professional musicians into your concerts? Before the Atlanta concert, we had a dinner and discussion that featured a panel of arts leaders, which we hadn’t done in Boston. I was amazed at the level of empathy and understanding that all of the artists had throughout this process. We’ve walked different paths, but as we all go through our careers, we’ve always been the only [person of color], or one of three or four, in rooms of hundreds of musicians. It can be isolating, and for us to create this sense of community was really powerful. Speaking with the artists, some of whom I hadn’t even worked with before, it almost felt like “Oh, it’s great to see you again!” Our similar experiences made it feel like like we knew each other. Creating that community where we all have an understanding of what it’s been like, and how hard it is being alone, has been really cool for us. We all found strength in the fact that we can be role models. Was there a difference between working with artists in Atlanta and artists in Boston? How did these issues manifest for them depending on where they live and work? With this question of how to create inclusive spaces, I think very often in the performing arts, we want to have one answer that’s all-purpose, but so much of it has to do with geography and community. The needs we have here in Atlanta, which is a Black city in a red state, are completely different than in Boston. Boston was more a time for me to learn to have a conversation and figure out how to have my feet in advocacy and classical music at the same time. My approach was more focused on highlighting musicians and the barriers they’ve overcome. My Atlanta concert was, too, but it was also about dismantling the system. Can you tell us a little bit about some of the topics that came up during your Atlanta panel? 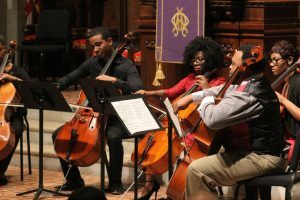 We had an El Sistema group perform two spirituals, which created a conversation about how El Sistema is attacking poverty, and how poverty can be traced back to slavery. 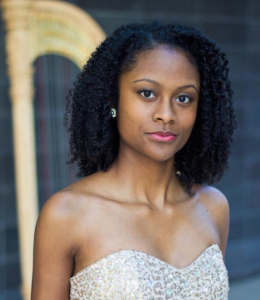 We featured a piece by Valerie Coleman, which gave us a space to talk about women, and advocacy for them within the classical music world. * The women’s march had happened recently, so it was a great time for us to connect those spheres. The last piece on the program was a commissioned work by Joel Thompson that honors the words of current inmates in the criminal justice system. ** That streamlined our talk from slavery to poverty, to mass incarceration. Although people were extremely engaged with the panel, one of the biggest pieces of feedback that we got was that they wanted even more time to talk. That was the biggest goal for me in the concert, not only to create a space where people felt welcome but also for people to leave having had a conversation about social justice. Where do you see Challenge the Stats going in the future? I’d like to bring programming that is classical music-focused into spaces that are more focused on social justice and equity . Panels and symposiums could be the main part, with classical music as the prelude. We’re flipping the script by doing this, walking into both of these spaces and being uncertain and unsure, but all along we’re developing our mission of highlighting the artist while attacking the system. Next February, we hope to focus our programming around poverty and its connection to homelessness, specifically in Atlanta, where there’s a large population of people who are without permanent housing. We’re hoping to include some people from those communities within our art – there are many people who are now living on the streets who have musical backgrounds. Going forward, I would love to develop our website into a space where people can find artists of color in their city. I’d love to see partnerships between organizations like us, and larger institutions, like orchestras and conservatories. We all have strengths in different areas of the community, and everyone is striving toward the same large and diverse audience, so it would be great for us to share audiences and experiences. 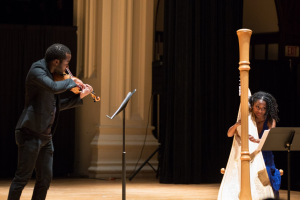 Angelica performs with violinist Tim Reynolds at the Boston launch concert. This has been a really inspiring conversation! Do you have any final words? I would just say I’ve been incredibly thankful for From the Top’s support from the get-go. When I was first on the show in 2011, I was able to talk about how Ann Hobson-Pilot, who was the first African-American woman to hold a position in a major symphony, had a massive influence on my life. I’m grateful to have been able to start that conversation. Using the From the Top Jack Kent Cooke Young Artist Award to study in Italy gave me the courage to get my degree outside of the US. It’s been really beautiful how From the Top has not only supported my artistry, but also my development as a woman of color, both in this field and the context of the nation. *Coleman is a founding member of the award-winning woodwind quintet, the Imani Winds. She is a respected composer of pieces for all instrumentations and is known for utilizing aspects of her African American heritage in her works. **Thompson is an Atlanta-based composer and music educator who works primarily in choral music.